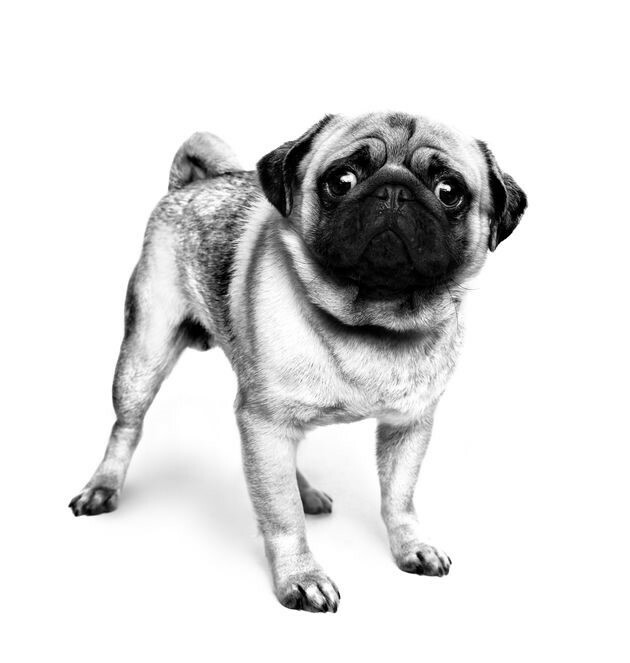 Learn about the Pug’s history, diet, and health and discover what makes this breed unique. Ever found yourself wondering “where do Pugs come from?” If so, you’re in luck because you’re about to find out! Also known as Carlin or Mops, the Pug is believed to be a very old breed who, like so many of the Molossian types, originated in ancient China. The Dutch East India Company brought the Pug to Holland in the 16th Century where they became very popular in the aristocracy, arriving in England when William of Orange ascended the throne in the 17th Century. Today, the Pug is one of the UK’s most popular breeds. The Pug has had many famous owners over the centuries; from William of Orange, to Marie Antoinette – there are few who can resists a Pug’s enormous personality! Of all the interesting things to know about Pugs, one particularly amusing fact is that the breed has been described as “Multum in Parvo” – Latin for “much in a little”. Their solid, stocky body should reflect that as they should be compact and muscular – but not overweight. The tail should form a tight curl. The Pug’s distinctly wrinkled face is, for many, the source of their beauty. A Pug’s nose should be black and fairly large, with wide nostrils. You will find that they should also have large, dark eyes. The Pug’s coat is short and sleek; it can be fawn, apricot, silver, or black. All have defined black markings on the muzzle, mask, ears, and trace (the line running from the back of the head down to the tail). The Pug is a charmer from the word go, they will find your weakness and exploit it without mercy! This breed is full of dignity and is of a happy disposition, whilst a Pug’s temperament is often calm and docile. They don’t like to be left alone and require regular company. They can be aloof with strangers and children, preferring to have their owner’s attention to themselves. An enthusiastic and enchanting puppy, the Pug grows quickly, reaching adulthood at around 10 months of age. As well as the usual challenges of growth – including supporting a developing skeleton, digestion, and natural defences – the Pug has to support a sensitive skin type. This is because its very short and fine coat provides little in the way of a barrier to any external irritants. Despite this, Pugs do tend to shed quite heavily. To minimise your Pug’s shedding at home, a daily brush is advised. Their wrinkles will also benefit from a daily wipe to remove any dirt and check for any irritation which can quickly take place. These Pug grooming practices are best started while they are a puppy. Ideal Pug puppy food: ROYAL CANIN® Pug Puppy. Although generally a very healthy breed, there is one big concern for the Pug – weight gain. This is a breed who generally likes their food, and some like it a little too much! A Pug’s diet significantly contributes to the maintenance and support of its health. When it comes to the Pug’s size, its stocky body should be lean and muscular, rather than fat, so an adapted diet with an ideal ratio of protein and fat is beneficial for helping to maintain your Pug’s weight. Pug owners are urged to be careful about feeding amounts and treats. Keeping its skin and coat nourished is also key to a Pug’s health. Nutrients that can support healthy skin include amino acids and omega fatty acids, as well as vitamins and minerals. Ideal adult Pug dog food: ROYAL CANIN® Pug Adult.